Harbourfront Centre is one of Toronto's most popular tourist attractions and one that offers city dwellers and visitors alike a chance to experience some of the best cultural, arts and educational events and activities in Toronto. The sprawling 10-acre site hosts over 4,000 events each year and is home to a large collection of venues on the city's downtown waterfront. The site attracts millions of visitors each year. In addition, the complex features restaurants, galleries, community spaces, gardens, art studios, an outdoor skating rink and much more. Whether you’re interested in dance, music, theatre, literature, family programming, waterfront activities or culture, there’s bound to be something going on that interests you. For more information about what to see and do, when to visit and how to get there, read on for the complete guide to Toronto’s Harbourfront Centre. Toronto’s Harbourfront Centre was established in 1991 as a not-for-profit charitable organization with a focus on helping to revitalize the city's waterfront, creating a cultural hub and offering a wide array of unique events, activities and festivals. What was at one time derelict land filled with long-forgotten industrial buildings is now a thriving campus-like site where there is always something going on, no matter the time of year. The best time to visit Harbourfront Centre depends on your interests and preferred time of year. There are always more festivals and events happening in the warmer months, but by no means will you be bored by what’s on offer in the winter. In the winter you can enjoy skating on Natrel Rink, which is generally open from mid-November to March. DJ skate nights also happen regularly mid-December to mid-February, as well as the Learn to Skate program. You can also expect some holiday programming in late fall and various performances, lectures, workshops and art exhibitions throughout the year. 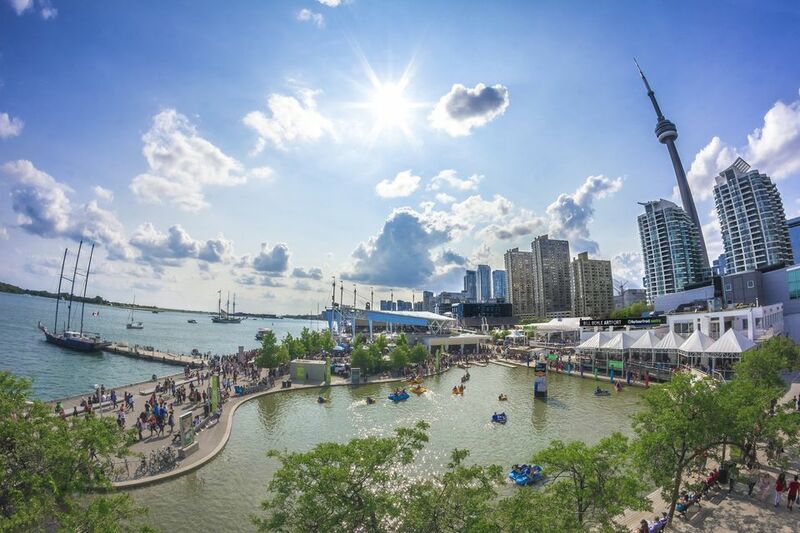 Summertime sees Harbourfront Centre in full swing, with the chance to hang out by the water and walk along the boardwalk that runs along the north shore of Lake Ontario. Natrel Pond (which gets turned into the skating rink in the winter) is home to paddleboat rides, summer camps and much of the Centre’s children’s programming. Warmer weather also brings several summer weekend festivals to the waterfront, free film screenings during July and August, as well as Summer Music in the Garden, a series of free concerts in the beautiful Toronto Music Garden. There’s always something to see, do, learn or experience at Harbourfront Centre. The indoor and outdoor non-profit cultural organization features year-round arts programming, unique annual events and world-class performances, making it an integral part of the city’s landscape. And the best part is that all events and activities are offered at reasonable prices or are completely free. Below are some examples of what you can expect from the Centre’s programming and site venues. From May to October, Harbourfront Centre is home to a multitude of events that celebrate various cultures, foods and destinations including the Hot & Spicy Food Festival, TaiwanFest, South Asia Calling, Barbados on the Water and Veg Food Fest – to name just a few. NextSteps, Canada’s premier contemporary dance series, happens from September to June. Camps for kids are offered over March Break and from June to August with over 80 to choose from. The Power Plant, Canada’s leading public gallery devoted to contemporary visual art, hosts exhibitions year round. Toronto’s International Festival of Authors (IFOA) happens over 11 days in October featuring readings, one-on-one interviews, panel discussions, special events and free book signings. The Craft & Design Studio is where you’ll find five working studios: glass, textiles, ceramics, metal and design. You can shop some of what gets created (along with other locally made pieces) at the Harbourfront Centre Shop. Learn to dance on the waterfront to the sounds of live bands (from swing to salsa) on Thursday evenings all summer with Dancing on the Pier. Shop a wide range of goods from around the world at the Lake View Market June to September, often curated to a weekend festival’s theme (be it cultural, regional or both). From May to October, enjoy Street Stage, a family-friendly season of street performers. There are several options to grab a drink or get something to eat at Harbourfront Centre, often with a fantastic view of the lake. Year-round you’ll find Lakeside Local Bar & Grill for casual eats, Lavazza Espression for authentic Italian coffee and Boxcar Social for craft beer, wine and coffee in a relaxed but stylish setting. During the summer months visitors can enjoy food and drinks at the Lakeside Local Patio and from May to September check out the international cuisines offered at World Café. If you’re opting to take public transit, from Union Station take either the 509 Exhibition or 510 Spadina streetcar west from inside Union Station (look for the Harbourfront signs to find the right exit). Both the 509 and 510 streetcars stop directly in front of Harbourfront Centre. If you’re biking, take the Martin Goodman Trail or take any street between Bathurst and Parliament heading south to Queens Quay West for a scenic waterfront ride. Bike parking is available. Drivers can head east on Lake Shore Boulevard, turning right onto Lower Simcoe Street and traveling south. Or head west on Queens Quay West and turn left into the Centre at Lower Simcoe Street. Underground parking is available on-site at 235 Queens Quay West, or above-ground one block west at Rees Street and Queens Quay West.